Last Friday evening, I was excitedly hurrying into the city during peak rush hour to catch the opening of Derek Au’s work at The Clay Studio in downtown Philadelphia. American-born of Chinese descent, Au lives and maintains his studio in Jingdezhen China, a region historically known for its ceramic traditions. Derek Au, “Tin Bowl”. Porcelain, 2.75″H x 4.75″D, 2012. Au’s pieces are made from delicate slabs of porcelain that he creates sympathetic to sheet metal patterns often found in tableware or more specifically, metal holloware. 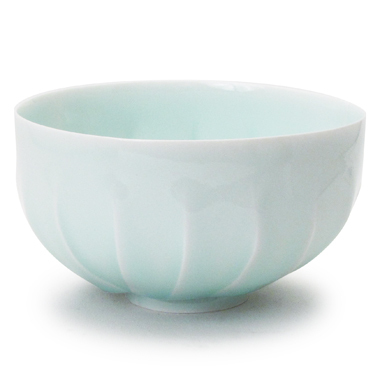 Pieces are perfectly celadon-glazed to create exceptionally functional tableware that at first glance do not appear to be something that one dines upon everyday. The imaginative display the curators of this exhibit envision actually employ silk-screened “stream of consciousness” quotes from the artist on the gallery walls surrounding the work; one of these quotes implies how one should not feel these ceramic pieces are intended to be “only for show” – but rather insists that one promises to interact with Au’s pieces at daily mealtimes. 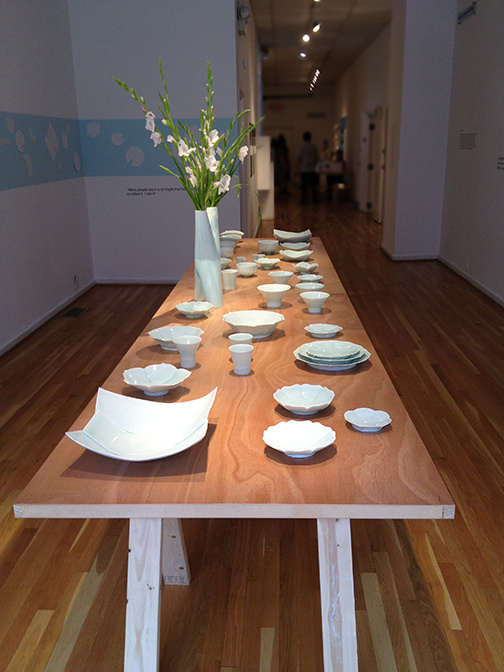 Derek Au: Installation view, The Clay Studio, opening night on Sept. 7th, 2012. Derek Au can be viewed through September 30th, 2012 at The Clay Studio located at 137-139 North 2nd Street in downtown Philadelphia, PA. I couldn’t possibly agree more – Derek’s pieces are so incredibly beautiful! Thanks so much for commenting and stopping by! This is the secret isn’t it? This is what runs my practice – and what I tried to share with my students. Ideas about making some kind or art or statement will usually kill creativity. Au’s exquisite pieces are a brilliant testament to honest artisanship. Absolutely beautiful work, which exudes the spirit behind the making. Thanks for the post – without it I might never have seen this. Thank you, Pete, for your wonderful comments – I completely agree w/you and found Derek’s pieces to exemplify his spirited honesty and perfection of his craft. The pieces look truly lovely. Thanks, Lu – Derek’s work is incredible to see in-person! Thanks so much for stopping by and commenting. Hi Patricia: thanks for sharing. I visited Jingdezhen China some years ago and did not have the chance to know more about local artists like Derek. I hope I will have the chance to see his works one day. Thanks Denise – Derek’s work is truly something spectacular to view, in-person. Likely I wasn’t in your WordPress reader b/c I’m overdue for adding a newer post soon. I’ve been busy in my own studio recently making new work, but I plan to add a new review about the arts here in Philly in the next week or so! Thanks again so much for visiting my blog. Good luck to your studio work! Inspirational. I keep getting messages that suggest I put out what is inside me and not overthink it. Your delightful posting agrees. I agree – as artists we all tend to overthink what propels us to make, and truly, should not allow our head to get-in-the-way of making. Thanks so much for your wonderful comments, gentlestitches! Barbara, you hit the nail on the head there…it can be brutal to be trapped inside a profession one doesn’t believe in. So great to hear from you, as always! Nice to meet you, Russel. I genuinely appreciate the “likes” and I am equally enjoying your blog, esp. the “chimney” piece from today! Thanks so much for “camping out” at artdoesmatter!